Looking for beading supplies or tools for bringing your wire wrap designs to life? 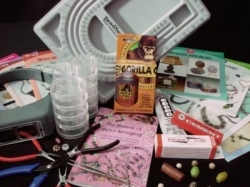 We stock the essential supplies for bead weaving and wire wrapping projects. Items include: beaded jewelry books storage trays beeswax and a wide variety of cutters and beading pliers. Our bead crimping pliers are the best tool for for finishing your beaded jewellery designs.